With his contract to Saber ripped from him by Caster’s Rule Breaker Noble Phantasm, Shirou is now officially out of the Holy Grail War, but he refuses to let Rin continue to fight on alone. Although badly injured and not standing a chance against the other masters and servants, he tails Rin and her servant Archer to the location where their battle with Caster is taking place. Little do they know that Archer has his own agenda and a secret that will change their lives forever. The second season of Unlimited Blade Works picks up right from where the first season left off, but despite there seemingly being no break in time between them, there are a few obvious changes in atmosphere and production. Luckily, the animation is not one of them. Firstly; there’s a shift of focus from both Rin and Emiya, to just Emiya. Somewhere between seasons Rin has stopped being the assertive, powerful and competent mage she was introduced as; now she’s mostly a side character to make way for Shirou Emiya’s arc, which is the entire focus for this season. Despite the sudden jump in power and ability that Emiya has gained between seasons, he still remains the weakest link in the series and sadly his story development in these 13 episodes does not help. The main conflict is this: Shirou Emiya wants to be a hero of justice, a man who saves all lives at the cost of his own without sacrificing anyone else, which is of course impossible to do as not everyone can be saved and some might not even want to be. Archer shows up as a result of these ideals taken to the extreme; he shows Emiya that the only thing that clinging to these flawed ideals will do is make him an emotionally and mentally broken man, cursing the day he was born and wishing to undo everything. Emiya is shown exactly what the fruit of his labour will bring, and how unhappy it’ll make him and those around him. So what does Emiya do? He decides to continue holding onto these ideals just as before. Why? Because… I don’t know, he’s got nothing else better to do, apparently. I’m not saying that I did not watch what happened, I’m saying that there’s no solid reason for Emiya to continue down this path. Despite the fact that Emiya and Archer talk for three episodes straight about what the ideals are, how flawed they are, why they bring about destruction and why they must be nipped in the bud, and then again just before the final battle, Shirou decides to do what is equivalent to a child sticking his fingers inside his ears and shouting ‘la la la I can’t hear you!’ when a parent tries to tell them off. Instead of repeating the same conversation over and over we could have had Emiya pointing out a more positive outlook on Archer’s memories, focusing on those who are living instead of the hordes of corpses we keep getting shown (which horribly is mostly piles and piles of black people) or Emiya recognising that just knowing his future is enough to change things like other time-travelling narratives tend to suggest. But we get nothing; we’re not presented any decent, strong upside to Emiya continuing down his route; he comes to the conclusion that because in this very moment he feels no regrets and he still likes the idea of a hero of justice, he’ll continue on. Instead of accepting his limitations and changing his unnatural view on life into a healthy one, it falls to the people around him (mostly Rin) to help him not become the broken man he might turn into. What a horrible message to land on, and what an awful position to put the poor girl in; Shirou can monologue all he wants in this show but nothing warrants this dim-witted attitude. If the show painted it as a terrible tragedy, it could have been a sad but effective continuation of Fate/Zero. A man’s sacrifice for the one boy he could save ends up turning him into someone just like him but worse; a man who wants to save everyone but ends up only bringing death. Sadly, the series wants us to think he’s being ‘noble’ – sorry, I’m not sold. The other reason these episodes differ from the first set is that, despite the first season trying very hard to tie itself with Fate/Zero whilst also maintaining the bridge for new fans to hop on by introducing new magical terms and techniques clearly, these batches of episodes give up on both entirely. They do try in the beginning with two episodes deviating from the visual novel to give backstory to Caster, and Illya has her own episode to wrap up her arc (abruptly, but it still tries) with links to the tragic end her parents had in the prequel, but from then on no attempt is made to clue the audience in on, for example, what Gilgamesh’s Ea (large black sword) is, or what makes Saber come to an emotional closure in episode 22 when all she’s done for the past few episodes is stand around and watch Emiya fight. Even the reveal of important Servants’ identities are blurted out and swiftly explained in throwaway dialogue with next to no impact; say what you want about Sailor Moon Crystal, despite most audiences knowing the Moon Princess, it at least they tried to make the reveal a big deal, given that it had a huge influence on the characters and the audience. Unlimited Blade Works, however, doesn’t feel the need to because, as many Type Moon fans would say, it was already covered in another route, which we don’t see here. Saber’s character arc was in the Fate route, so in Unlimited Blade Works she takes a back seat. This would be understandable if you were playing the video game and went through one route straight to the next but we haven’t. At best the audience knows next to nothing about her and won’t care much, at worst the Fate/Zero fans will desperately want to know why the poor girl ends up being a pawn for the Emiya family. Adapting a story from one medium to another has been done many times over; from book to film, from comic to TV series, from video game to big screen, etc. And yet there’s no one sure way or foolproof equation for adapting from one to the other seamlessly and without error; each story and every medium has its own pros and cons to consider when adapting, and that’s without taking into consideration the fan expectations. For example, when adapting a book you have to consider its mountains of text; the detail that went into the world building, the characters’ inner monologues and descriptions of locations. For video games it’s the interactive element; how do you get around the player immersion and present the story just as effectively without a controller involved? Visual novels have a combination of these strengths and weaknesses, especially Fate/Stay Night which had three routes with their own character focus and stories to tell; there were pages and pages of dialogue and the player was experiencing it all from Shirou’s point of view. Who is the adaptation being made for? The obvious answer seems to be ‘for fans’ but that’s where a lot of more niche attempts such as Vampire Academy and the more recent Warcraft film fail to break bank, because an adaption can’t just be for a small minority. You can’t expect everyone who loved the original story to cross over to the new medium to experience it again in a new way. For example, the first Star Wars film has probably been seen by an extremely large majority worldwide; however, not every person who has watched the film has gone on to read the books, or to play a video game version of it, or to listen to the radio drama. Having an audience follow the story in the same medium (film, in this case) is a big ask in itself, but asking them to pick up a comic book would be a stretch. So despite fans wanting it to be for them, the answer is that it has to be for a general audience; the more people (whether they liked the original story or not) that come to see the new, more accessible version, the better. Aim broader and hope the fans of the original will follow suit. How much of the story do you adapt? Again, the temptation is to answer ‘all of it’ but sometimes it’s just not logically possible; a scene where characters think of a scheme then talk to their opponent to fish information can work wonders written down, but visually it’ll be incredibly boring. Trying to cram an entire video game backstory into one movie will only result in being incredibly rushed and making little to no sense. The Harry Potter franchise split the last book into two films to avoid this problem, while Game of Thrones is a TV series spreading each book across its own season because George RR Martin knew squeezing each book into the restricted time of a movie would be intolerable. Does the adaptation work on its own? Imagine if The Lord of the Rings movie did not have the opening scene explaining all the different rings, why the ‘One Ring to Rule Them All’ has a special pull to it and the villain’s motivation for wanting it. Imagine if you had to read the book first before watching the first film to understand what’s going on; not only would you be incredibly confused and frustrated, but the movie trilogy would have nowhere near the amount of fans it has now. Luckily, The Lord of the Rings explains its mythology, the world and character motivations clearly, so non-book-readers can understand the story and become attached to the characters without needing prior knowledge. Now that all that information is laid out, let’s put these questions to Fate/Stay Night: Unlimited Blade Works. Because of the nature of the three routes, adapting just the one with no additional material from the other routes would be detrimental to anyone outside of the game fans. In the Visual Novel, Fate served as an intro, Unlimited Blade Works was middle ground, and Heaven’s Feel is the final conclusion. Studio ufotable did include some anime-exclusive scenes to help connect the dots when it needed to for the side characters and villains but it does not take cues from any other route. Which is why Saber is mostly cast away and does not get a fitting continuation from her development in Fate/Zero, why Sakura disappears after episode 8 and is not seen again until the Epilogue, why Shinji gets away with his horrible actions and seems to learn nothing as a result in the end, and the less we think about Kotominei’s final unfulfilling moments the better. The 2006 Fate/Stay Night anime was flawed but at least it did try to add depth with arcs for all the characters, giving weight to the right moments and padding out the revelations (such as the connection between Rin and Sakura) to make the story more than just Shirou and Saber’s love. It didn’t always work but at least it tried to be its own story, without relying on outside knowledge to support its weight. The answer is a resounding no. The anime falters at deviating from the source material to make the big character reveals and emotional payoffs work. The world building is hastily explained at best or just ignored at worst; as previously mentioned most characters outside of Shirou and Rin are half baked or not developed at all, and the main conflict by itself is not deep, interesting or resolved strongly enough to carry itself through all 26 episodes. Before we wrap up let’s throw in a few positives. The animation is still really good; it’s not as polished as the first half but it still glimmers with effort. The same can be said for the action scenes; although they rely a lot on recycled set pieces (the Unlimited Blade Works desert world and Gilgamesh’s glowing sword powers) but they’re well-choreographed regardless. The score by Hideyuki Fukasawa also packs a punch; Type Moon fans will get a kick out of the new version of Emiya’s Theme especially. The new opening theme by Aimer, ‘Brave Shine’, sounds very different to the previous opening; like an early 00s rock anthem. Kalafina return with the ending ‘Ring Your Bell’, which sounds like part 2 of ‘Believe’, using similar chords and chime sounds but with a more uplifting vibe to the song. DVD extras are sadly restricted to clean opening, closing and promo trailers. The OVA ‘Sunny Days’ (animating the alternative ending to the original game route) is not included here. 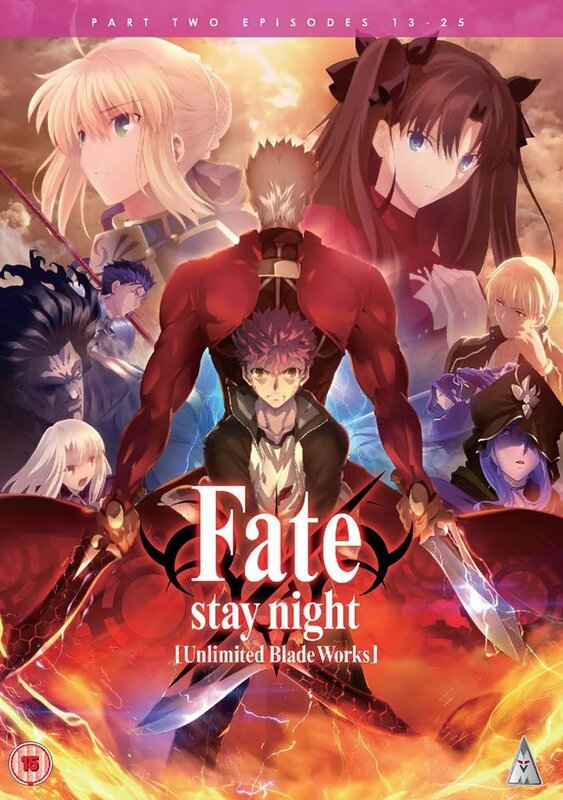 Fate/Stay Night: Unlimited Blade Works had a great start and heritage to work from with all the right elements to make it a superb masterpiece, but instead its poor writing and rigidity in deviating from the restricted POV of the original Visual Novel shackled it before it could take off. It all looks and sounds impressive but in the end, the dialogue and main character who never learns turned the whole journey into wasted noise. It’s for fans of the original game only, I’m afraid.